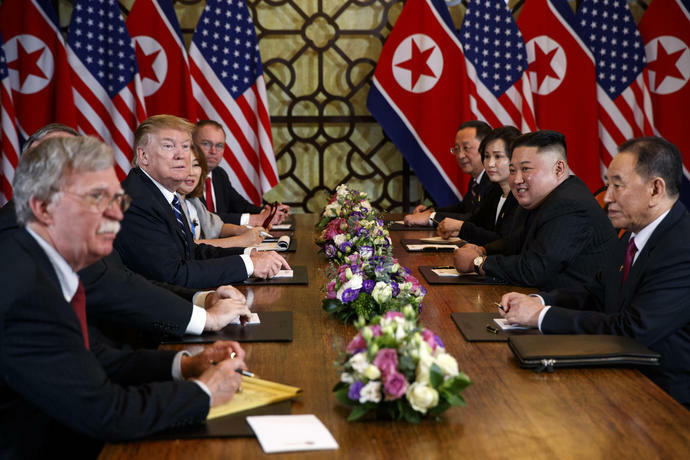 WASHINGTON (AP) - President Donald Trump is suggesting that a congressional hearing Democrats arranged with his former personal attorney may have contributed to his failure to reach a summit deal with North Korean leader Kim Jong Un. Trump left his summit in Vietnam with the North Korean leader last week without reaching an agreement after Trump said he wasn't willing to give in to Kim's demand to lift U.S. sanctions at this time. He lashed out at Democrats in a tweet on Sunday, criticizing their decision to hold the hearing featuring his former lawyer, Michael Cohen, while he was overseas. "For the Democrats to interview in open hearings a convicted liar & fraudster, at the same time as the very important Nuclear Summit with North Korea, is perhaps a new low in American politics and may have contributed to the 'walk,'" Trump tweeted. "Never done when a president is overseas. Shame!" 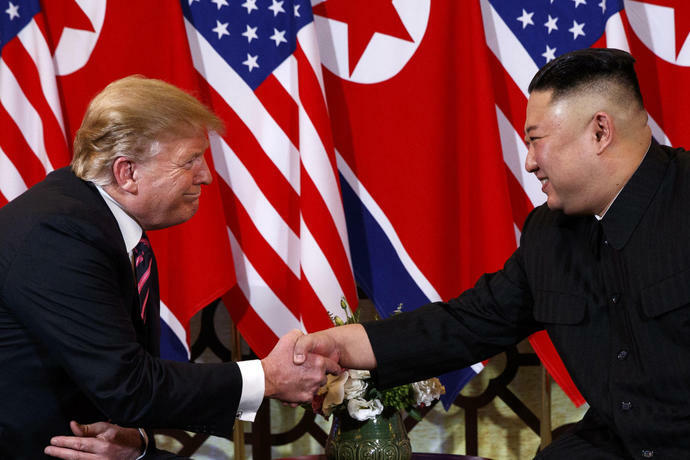 But after returning to Washington, and seeing the largely negative media reaction to the summit, including about his answer about the death of college student Otto Warmbier, Trump went a step further. He seized upon an idea being floated on the right, including by his eldest son Don Jr. on social media, that the Democrats' hearing was not just a distraction, but a deliberate attempt to undermine the negotiations in Hanoi, according to the Republicans. The president complained to one confidant that the hearing made him "look weak" to Kim Jong Un, as did a reporter's shouted question about the Cohen matter in front of the North Korean leader. The White House did not immediately respond to questions about why the hearing would have contributed to Trump's decision not to accept Kim's terms or whether members of the North Korean negotiating team indicated they were aware of the Cohen news coverage in the U.S.
As Trump wrapped up his trip to the summit last week, he complained that Democrats had scheduled the hearing at the same time as his negotiations. He described it as a "fake hearing" and said having it in the middle of this "very important summit" was "really a terrible thing." Trump said they could have held it a few days later and had more time to prepare. In his Sunday talk show appearances, National Security Adviser John Bolton described the summit as a success despite the lack of an agreement providing for verifiable dismantling of the North's nuclear sites. Bolton, in three television interviews, tried to make the case that Trump advanced America's national security interests by rejecting a bad agreement while working to persuade Kim to take "the big deal that really could make a difference for North Korea." Trump on Monday complained about how that decision was covered in the media, tweeting: "The military drills, or war games as I call them, were never even discussed in my mtg w/ Kim Jong Un of NK_FAKE NEWS! I made that decision long ago because it costs the U.S. far too much money to have those "games", especially since we are not reimbursed for the tremendous cost!" 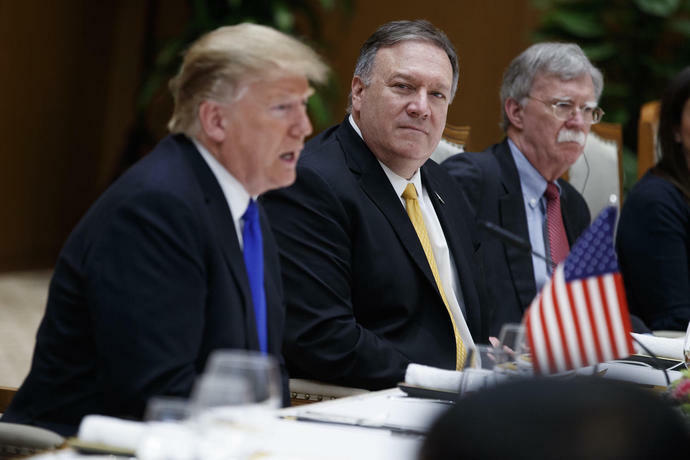 The U.S. and North Korea have offered contradictory accounts of why last week's summit in Vietnam broke down, though both have pointed to western sanctions as a sticking point.